How do punnett squares work? It shows the possibilities of the offspring from two parents with known genotypes. The ones with 4 outcomes are taking into account one gene. Those with more outcomes take into account multiple genes. Anyways for one gene it has a column or row for each parent and the choices of genes to contribute to the offspring. 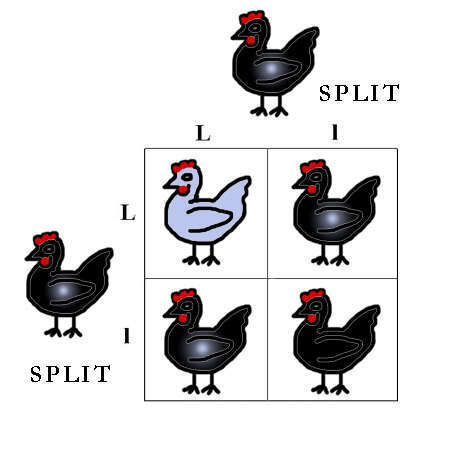 In each intersection of a row and column the allele for that row and also that column is entered; each square (for a single gene punnet square) shows the probability for 25% of the offspring. 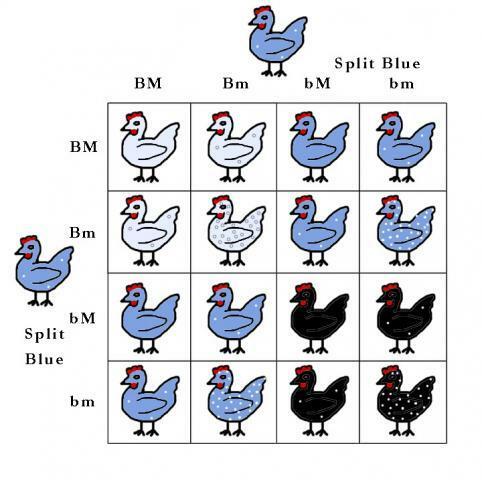 A punnett square is a matrix between the possible gametes (eggcells and spermcells) of the parent animals. 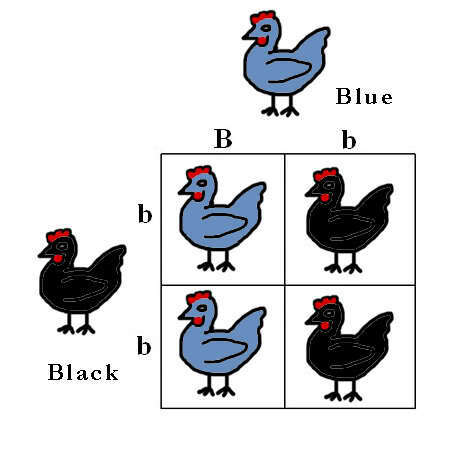 In the matrix body are the possible outcome of the cross, being the combination of the one genotype from the column header and the one genotype from the row's first field (=row header?). So the column headers are the gametes of one parent, and the rows' "first fields" are the gametes of the other parent. Punnett squares ( named after Reginald Punnett) is used to make predictions concerning how alleles come together to make the offspring from two parents. The Punnett square also predicts the probability of a specific phenotype ( color, ect.) being produced when an allele from the mother combines with the allele from the father. 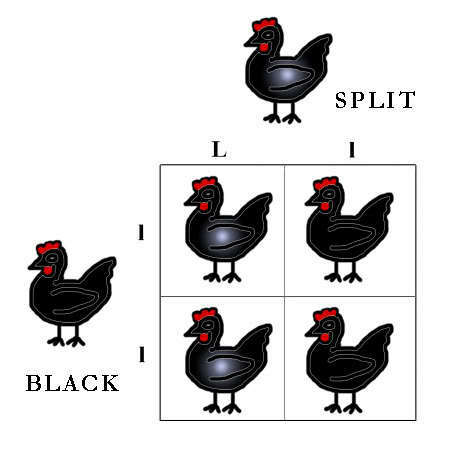 For simplicity, lets say the extended black allele ( E) produces a black chicken; so the father will have two E alleles for extended black and be E/E. He will only give one E allele to each of his children. He has two alleles: when he makes sperm one E will go in one kind of sperm and the other E allele will go into the other kind of sperm. 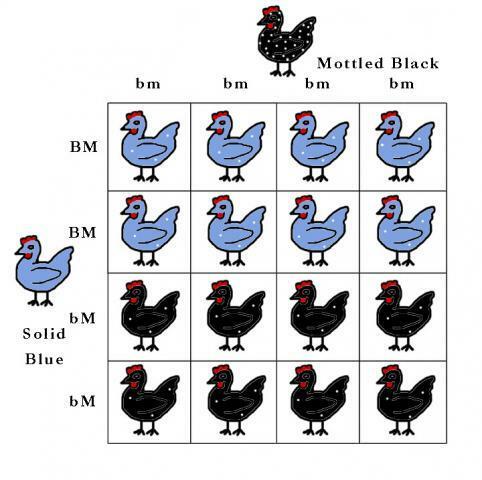 If the mother has an extended black allele E and a wild type allele e+ ( she is E/e+)she can make eggs that have an extended black allele and eggs that have the wild type allele. Like the sperm, the eggs can only contain one allele either an E or an e+. So you make a square. Fathers sperm goes on top and the mothers eggs go on the side. 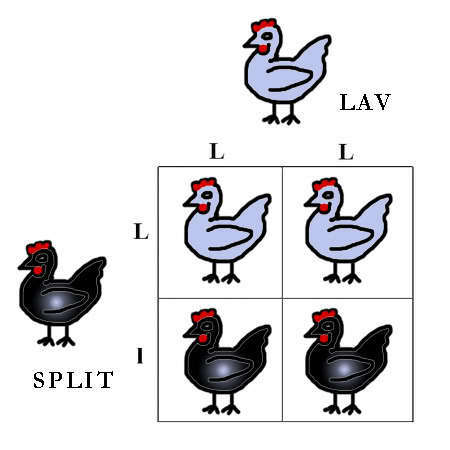 The sperm and egg come together in the square so half of the offspring or 1 in 2 of the offspring will be solid black or E/E the other offspring will be or 1 in 2 of the offspring will be pseudo birchen similar to a birchen bird (black with some red or white in the hackles). Now watch what happens if you cross a male who is E/e+ with an E/e+ female. The probabilities will be different. Now the offspring are different, you get one in four that are black (E/E) , 2 in 4 that are pseudobirchen (E/e+) and 1 in 4 that are wild type (e+/e+) or recessive for a trait. You get three different colors from this cross. 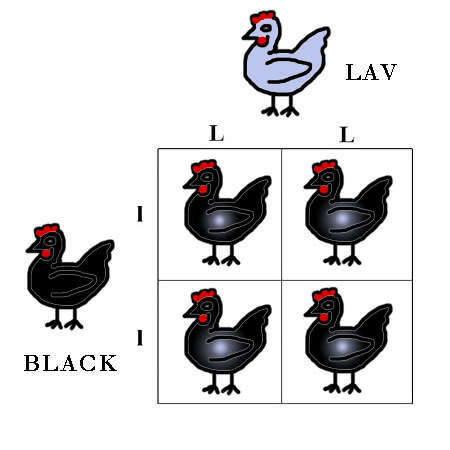 So if you hatch 20 birds 5 should be black , 10 will be pseudobirchen and 5 will be wild type. The numbers are probabilities which means the numbers of colors will most likely not be exactly 5 to 10 to 5. If you hatched 1000 birds then the numbers will be close to the 5 to 10 to 5 ratio or 1 to 2 to 1. Remember when you are doing Punnett squares always use a capital letter to represent the dominant gene (E) and a lower case letter (e+) to represent the recessive gene. The plus sign indicates the gene is a wild type gene or would be found in a wild population. The genes are actually represented in a different manner now; this is the older style of writing genes and it works best for people learning genetics. The new way of writing genes is different. Extended black is E*E and wild type is E*N. Work on the E locus is on going so the way the genes are written may change. There is another scientific way of writing genes which is more complicated so I will not go into the newest way because you would have to have a back ground in biochemistry to really grasp the concepts. 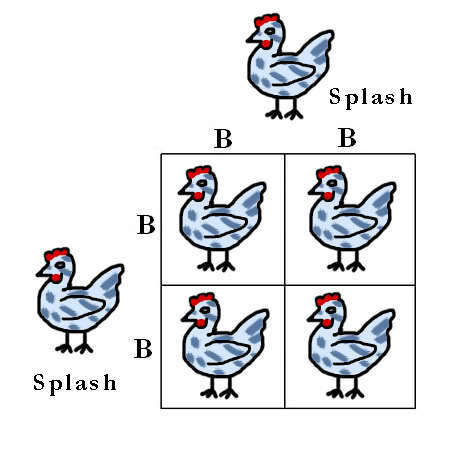 Once you understand how to make punnett squares use the punnett monkey.